Castle® F-105™ is a highly active low foam sanitizer cleaner for equipment and utensils in food processing, dairy industry, bars, restaurants, institutional kitchens, and farms. 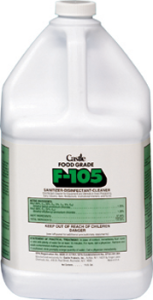 Castle® F-105™ is recommended wherever the maintenance of sanitary, clean conditions is indicated. Castle® F-105™ contains a non-ionic wetting agent to promote rinsing, thus assuring film-free, spot-free equipment and utensils. 1. Add one ounce per gallon of water. No rinse required. 2. For heavily soiled equipment or utensils, pre-clean with a good detergent. 4. Apply recommended dilution of Castle® F-105™ with a cloth, mechanical spray device (spray surface until thoroughly wetted) or immersion.